Home > Music > Headphones, Earphones, and Earbuds > Got Ears? Muffones Ear Muff Headphones with Smart Phone Ear Buds Built In! Got Ears?® Muffones Ear Muff Headphones with Smart Phone Ear Buds Built In! Got Ears? Muffones Ear Muff Headphones with Smart Phone Ear Buds are the perfect solution for listening to music outdoors when the weather is cold. These quality ear muffs feature stylish design, super-soft comfy hypo-allergenic "fur" lining and a set of quality smart phone ear buds built right in. Muffones Ear Muff Headphones fit behind the head, and fit amazingly well -- Muffones really do stay on without falling off, they still fit comfortably, and they sound pretty great. Muffones come in two different styles. The quilted style features a smooth quilt-stitched fabric, and is a bit lighter-weight than the knit style, making them ideal for cool-weather wear. 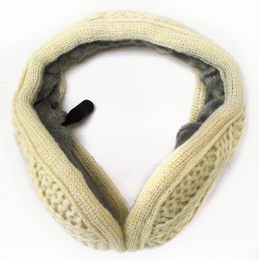 The knit style features an old-fashioned sweater-knit design that looks great with any winter outfit, feels soft and fuzzy, and is sure to keep your ears super warm even in very cold weather. Muffones Ear Muff Headphones have a modular design that lets you remove the cord when you just want to use them as ear muffs, and plug in the cord when you want to listen to music from any portable music device or make and take calls from your smart phone. The handy in-line control module has volume control, an omnidirectional microphone for hands-free calling, and a one-button connect-disconnect button for simple call control. Here is a perfect gift for that hard to buy for friend or family member! Muffones are ideal for almost any outdoor winter activity including Walking, Jogging, Biking, Skiing, Snowboarding, Off-Road 4-Wheeling, Hunting, Hiking, Ice Skating, Bird Watching, Horseback Riding, and more! You can even plug Muffones into an FMRS 2-way radio and keep your ears warm while you keep in touch with others in your outdoor party. Comfortable, adjustable clamp-on design sized to fit most anyone. Large diameter drivers for full rich sound. Modular design lets you remove earphone cable when you want to use the earmuffs without music or phone. In-Line module has a thumb-wheel Volume Control, omni-directional microphone for hands-free calling, and a one-button smartphone call connect/disconnect. Standard 3.5mm stereo plug fits all portable music players, most smart phones and FRMS 2-Way radios. One meter removable modular cord with shirt clip. Product Reviews for Got Ears? Muffones Ear Muff Headphones with Smart Phone Ear Buds Built In! Got Ears? Muffones Ear Muff Headphones with Smart Phone Ear Buds Built In!4KimiJanuary 19, 2015I love the sound and the sturdiness of the ear muffs (they are very warm!) But one thing I've noticed is that they tend to keep slipping downwards while I'm wearing them. Maybe something that could be corrected with the capability to adjust. Got Ears? Muffones Ear Muff Headphones with Smart Phone Ear Buds Built In!4KEVINDecember 4, 2013bought 2 of these( white and black) and was pleasantly surprised at clarity and volume. they are comfortable also... I like the detachable wire, although spares are not currently available. Got Ears? Muffones Ear Muff Headphones with Smart Phone Ear Buds Built In!5K PayneFebruary 5, 2013have been using mine for a week, love them. Very warm and comfortable. The sound is great. Hope they last. Would make great gifts. Got Ears? Muffones Ear Muff Headphones with Smart Phone Ear Buds Built In!5william lewisDecember 29, 2012great product can use them ,while sitting in my ,deer blind also good for just walking around in the woods.